Earlier this week the NSW Premier Gladys Berejiklian unveiled the final design for the new Sydney Fish Market which will become the catalyst for the revitalisation of Blackwattle Bay and provide greater public access to Sydney Harbour and its foreshore. 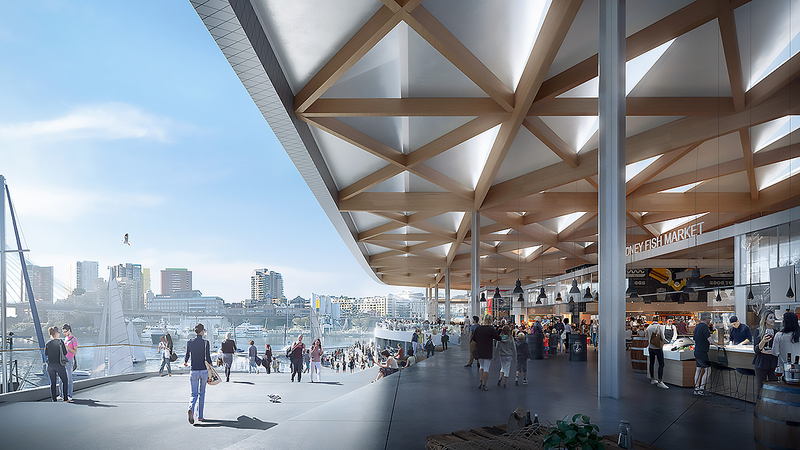 More than just the largest fish market in the southern hemisphere, the new development aims to provide significant public and cultural amenity and a new icon for Sydney, while also establishing a public connection to the water’s edge at Blackwattle Bay. The Premier said the purpose-built retail and wholesale facility will be positioned over the water as "the centrepiece of a new harbour-side precinct, taking advantage of panoramic views to the Anzac Bridge." As part of the development, the Sydney Fish Market will relocate from its current location to a 3.6-hectare site on an adjacent wharf in Blackwattle Bay in Sydney Harbour, which is expected to rival the world’s best markets. food stalls showcasing Australian produce to the world. 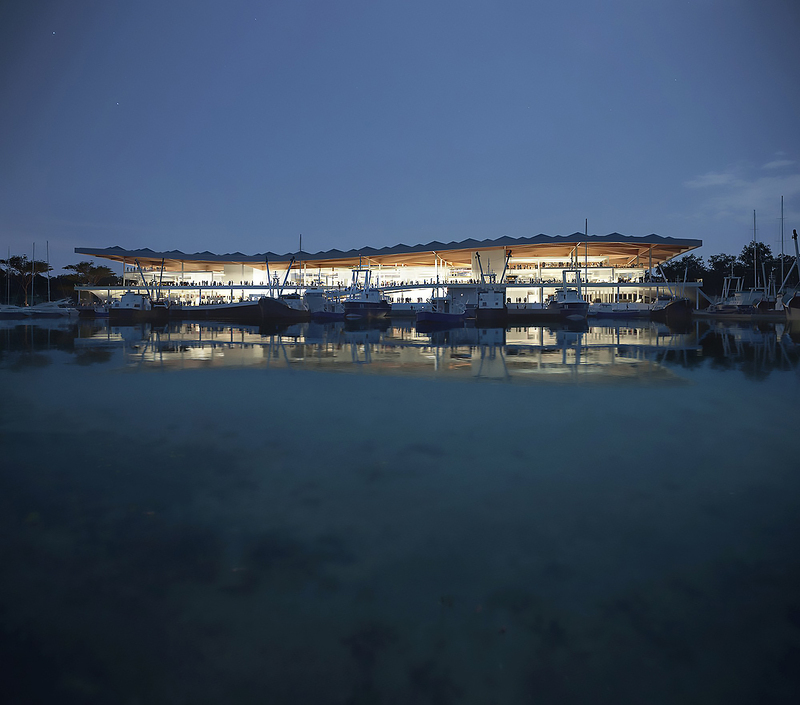 The building, which was designed by a team led by Danish architecture firm 3XN in collaboration with local architect BVN, GXN Innovation, and landscape architect ASPECT Studios, will feature a unique timber and aluminium roof inspired by fish scales floating over the building like a canopy. It will house an expanded seafood cooking school, food kiosks, restaurants, bars and outdoor spaces for social events. The winning team was selected through an international process, with a mandate to integrate significant sustainable and public amenity elements. 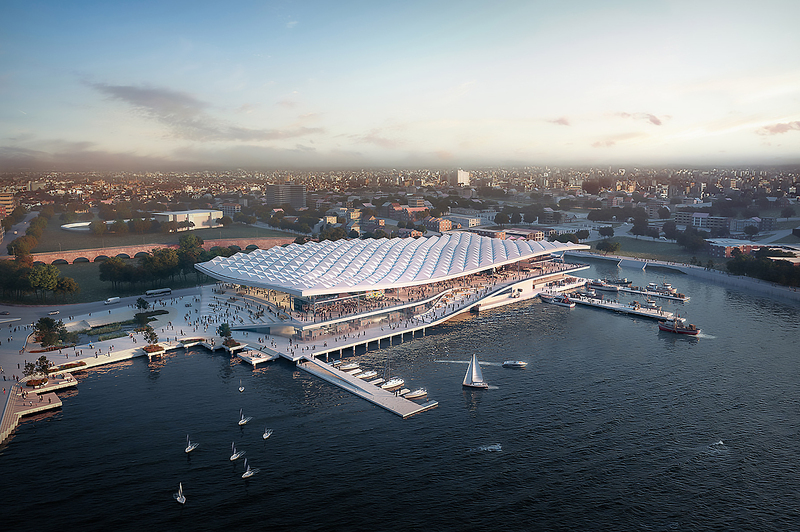 The Design team approached this project with the specific goal of creating more than just a fish market; it is first and foremost a major cultural facility that enhances the existing market operations while creating generous public amenity to unlock the waterfront for Sydneysiders and visitors alike. The design capitalises on the opportunity to link the bay with the significant green space of Wentworth Park to the south, and the entire Sydney community. UrbanGrowth NSW Development Corporation, the NSW Government agency responsible for bringing together economic, social and environmental benefits to create extraordinary places, has been working with the team since 2017 on meeting the brief to produce an iconic fish market design for Sydney. The design team says it was inspired by the traditional market typology, which appears throughout history and across cultures. Market are considered the social hubs of cities around the world and generally comprise a series of stalls that are open to the air but covered by a canopy and located in a large plaza. Preserving the authentic market feel was a key objective and driver of the design in addition to maintaining a human scale with a true market atmosphere. Another key driver behind the design was resolving the conflicting requirements around public accessibility within an operating harbour and wholesale market. According to the design team, it was critical that the visual connection between the public areas and wholesale or wharf operations were maintained. The new design locates all the functions traditionally associated with fish markets – the landing and loading of fish, the wholesale market, and the auction hall on the ground floor. An amphitheatre and the foreshore promenade wrap over the operational wharf, providing visual connections for visitors to observe the operational activity, while still keeping them safe and separate. Plazas located at either end of the fish market encourage and facilitate informal gatherings, creating additional connections between the public and the water. and house wetland flora to filter both stormwater and grey water from the building. These bio-filtration systems filter water and can provide a protective habitat for local birds while filtering the immediate site water run-off. The amphitheatre staircases that lead from the plazas to the public market extend and expand the surrounding landscape while establishing a foreshore promenade around Blackwattle Bay. This creates a new public route along the water’s edge with the stairs also providing public spaces where people can enjoy their food and the view over the bay to the Anzac Bridge. The building’s unique timber and aluminium canopy forms an integral part of the design responding to the spatial demands of the program below in addition to environmental factors. The design will allow the canopy to be permeable as possible, minimising the need for conditioned air, while also deflecting the direct sun. Other sustainable design features include the ability to harvest rainwater for reuse, protects the retail spaces from the sun, and filters daylight for operations below. The unique form uses prevailing winds to extract hot air and protects the sellers from southerly winds. Environmental and social sustainability are essential and inseparable parts of the design. The roof, landscaped forms, open atmosphere, plantings and materials that characterise the experience of the design are examples of this union. Throughout the course of the new Market’s concept and design development; public amenity and environmental sustainability have formed the core of our decision-making processes. 3XN’s response places people at the centre, with an emphasis on place-making to foster a strong sense of community. The design excels in its ability to create value for all stakeholders; the fisherman, and restaurateurs as well as neighbours and tourists. Danish designers delivered the iconic Sydney Opera House and we have great expectations that the Danes will deliver again with an iconic new Sydney Fish Market. We’re inspired by 3XN’s credentials and are excited to work with them to see our redevelopment vision come to life. The Sydney Fish Market currently attracts more visitors annually than the Great Barrier Reef and accounts for around 20 per cent of international visitors to the Sydney region. It is already the largest fish market in the southern hemisphere, trading approximately 14,500 tonnes of seafood per year. This brand new fish market will draw locals and visitors to Blackwattle Bay to experience the excitement of an authentic market and auction floor, and taste some of our finest seafood in state-of-the-art surrounds. This will become a vibrant economic and community hub that supports NSW’s fresh seafood industry, our professional fishers and coastal fishing towns from Eden to Tweed Heads. Relocating the fish market to the new site will return Blackwattle Bay’s foreshore to the public, improve pedestrian and cycling links and connect more of Pyrmont to the water as part of the long-awaited revitalisation of the area. Sydney Fish Market is a beloved institution among Sydneysiders, Australians, and international visitors. Therefore, it was integral to select a design team that will modernize and improve the site while recognizing its long-standing heritage and retain the authentic experience that attracts customers and visitors.